This is going to be what I now believe is called a ‘longform’ post. i.e. more than three lines and two photos. It has been about five years now since I picked up a bag of flour and wandered dustily down the bread road. Other people in the same time span have started their own businesses, gone to baking school, and done all sorts of wonderful things seduced and entranced as they are by the whole baking world. I still haven’t made croissants or doughnuts, but I like to think I can make a reasonable loaf of sourdough and great pitta bread. 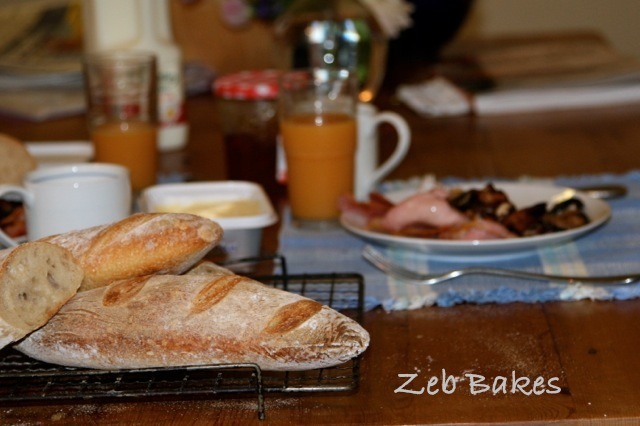 In this post I just wanted to have a little chat and a meander through my baking past such as it is, because I sometimes think that people don’t quite believe that we all go down the same road more or less trying to figure out this bread thing, which is how to make bread that makes us and the people we share it with happy! 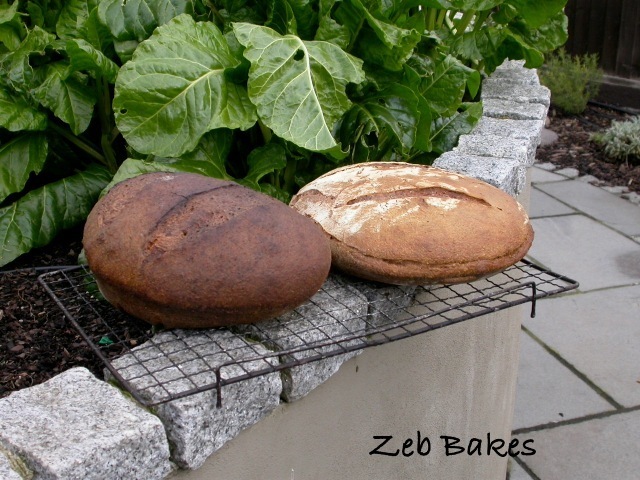 Here we have two of my very earliest loaves, I was very ashamed of them, but I also thought they were quite funny so I took their photo vowing that I would do better next time. They were both made from the same dough, the flatter of the two on the right had stood for about an hour longer than the other one before being baked and was completely and utterly overproved. The very dark one had been in the oven for ages at a very hot temperature. All those hours of waiting and I wasn’t very impressed. This was an experiment in not kneading and not folding and putting dough in the fridge overnight. I thought I would be even more minimal than the most minimal of bakers and very clever. 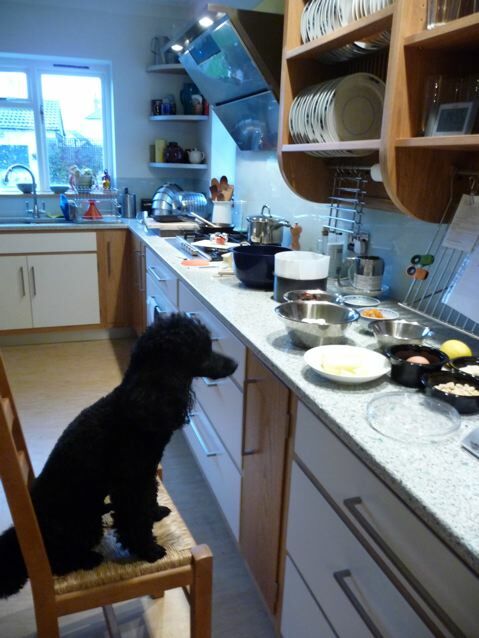 I hadn’t really understood that you have to get rid of some of the bubbles in the dough, or stretch and shape it. As you can see it turned into a mouse cathedral, and rose in a way I have never been able to replicate since. I think there was so much air in the dough that it just didn’t know what to do. Ah me. 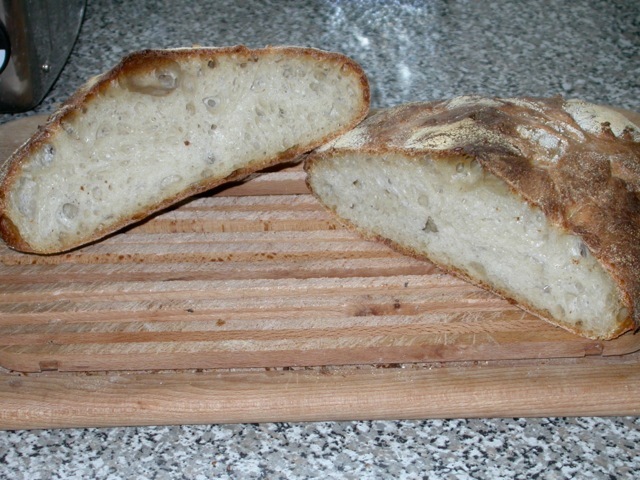 This was my first attempt at a basic white sourdough made with Dan Lepard’s recipe in the Handmade Loaf. 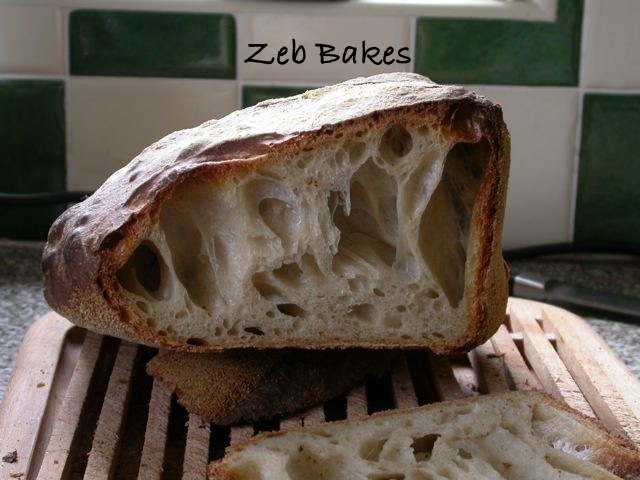 It is a simple dough but not an easy one to handle if you are starting out. I read somewhere the other day that simple is not the same as easy, and this certainly applies to bread making. I think I had used so much oil to handle the dough that the crumb took on a shine resembling my face after a day in the kitchen. 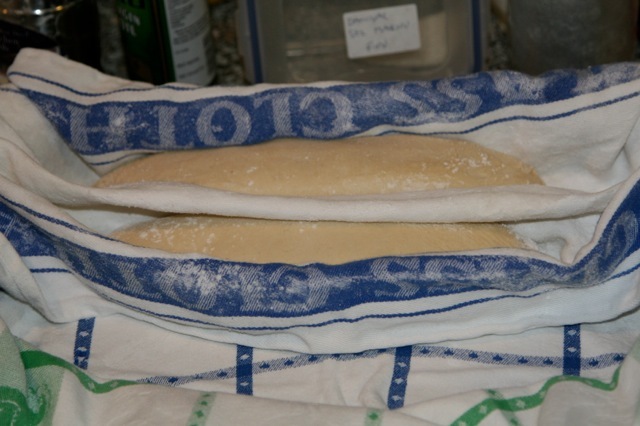 Using oil to shape dough is very useful, but too much can cause problems, particularly when it comes to sealing the seams underneath with a firm dough. Use it sparingly and save yourself this grief. 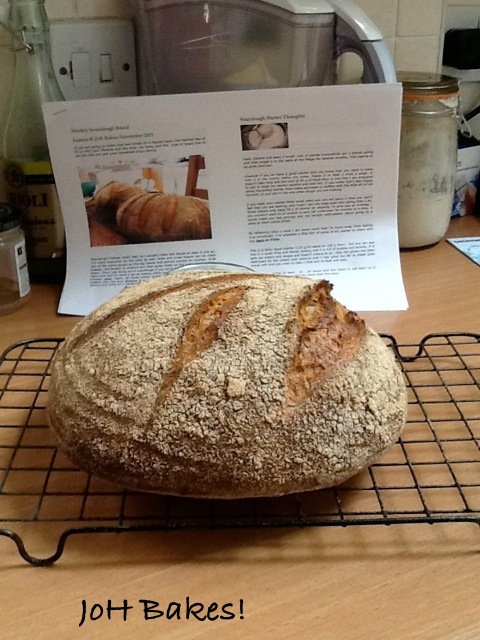 At this point I spent a lot of time reading about flour and reading bread books and decided that if only I had the ‘right’ flour I would make much better bread. In fact I hummed and hawed about this a lot, bought all sorts of different flours and experimented madly, and spread myself so thinly that I never really knew what I was doing. I made an attempt at overnight sourdough baguettes and was appallingly pleased with myself. In fact it is just sourdough in baguette shape but no matter. As I have said before I am not a perfectionist and am easily pleased! Look at their funny little shapes and their slashes! I proved these in my old cotton teatowels, no fancy couche cloth here, not a clue really what I was doing, but I do remember eating these, baked from cold from the fridge and being extremely happy and greedy. 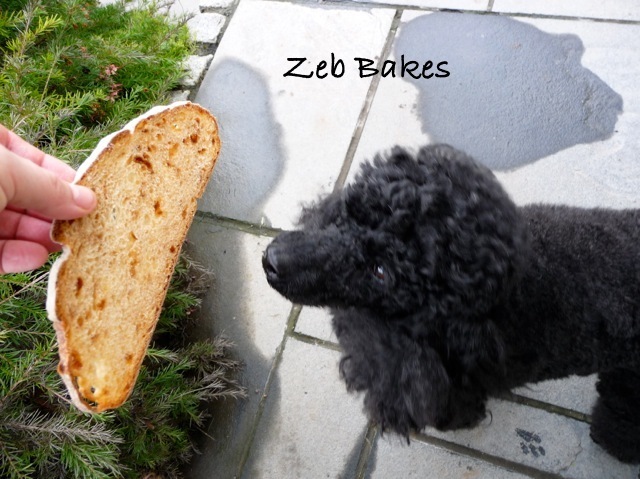 I carried on making breads and posting about them on Dan Lepard’s forum, I shyly chatted away to people who also posted. I made friends, I asked questions, I began to think I knew some of the answers and tried to help people who also turned up, the curse of being an ex teacher and wanting to share knowledge, partial though it was and still is. It was a lovely forum, with a great mix of people from experts to beginners and was very gentle and friendly. I admit I bought brotforms, in those days not as easy to find as they are now, so I ordered some from Germany. I found two french banettons with linen liners in a catering suppliers in the UK too. My early banetton loaves had a ghostly white pallor as I had read somewhere to dust them with potato flour to stop the dough sticking. It works fine but doesn’t change colour in the oven at all. The loaves were beginning to look like loaves that made sense to me at last. So here’s to all of you brave and foolhardy people who drag a bag of dry flour into the kitchen, squint at a recipe, wonder over instructions like ‘give the dough a turn’ or ‘ form a boule’, who convert cups to grams and ounces to handfuls, burn your arms and skid on semolina, to those of you who sit by your ovens and smile as the bread rises, feed your friends and family, share pictures and stories, advice and lore on the internet, with your salt and your leaven, your ferments and baskets, I salute you, may your bread rise and your crusts sing and crackle! Oh and a last word of my best well-meaning advice – don’t worry about what they do on TV, follow your instincts, take it all with a pinch of salt, they don’t know it all, no one does – question everything, practise lots, study your failures, as they will tell you more than you think, and have a good time! 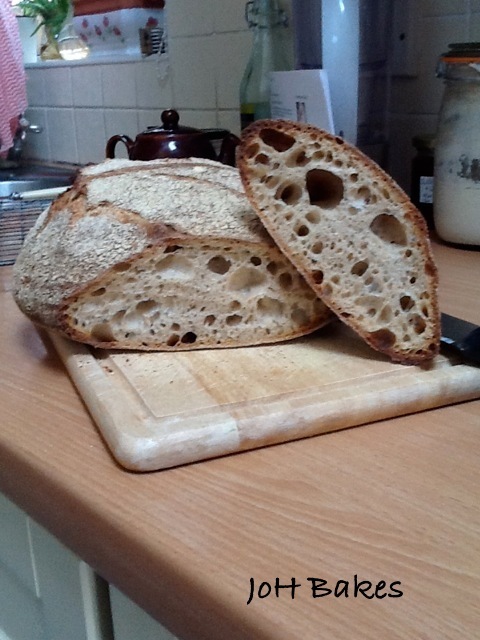 This entry was posted in Bakers, Bread, Pure Joy and tagged baking, Bread, happiness is bread shaped, sourdough magic on 13/04/2013 by Joanna. Spelt grain belongs to the wheat family of field crops. It is often described as being an ancient grain or a heritage grain. Interest in these heritage grains has increased in recent years, both on the part of consumers and amongst researchers into crop genetics with an eye to maintaining a gene reservoir for breeding programmes. The ancient grains are credited with being more adaptable to poor soils and harsh climactic conditions as well as having attractive nutritional attributes. Spelt contains gluten and is not suitable if you have coeliac disease. It is claimed that some people find it easier to digest than bread made from more modern wheat; this is something that I am not qualified to comment on. 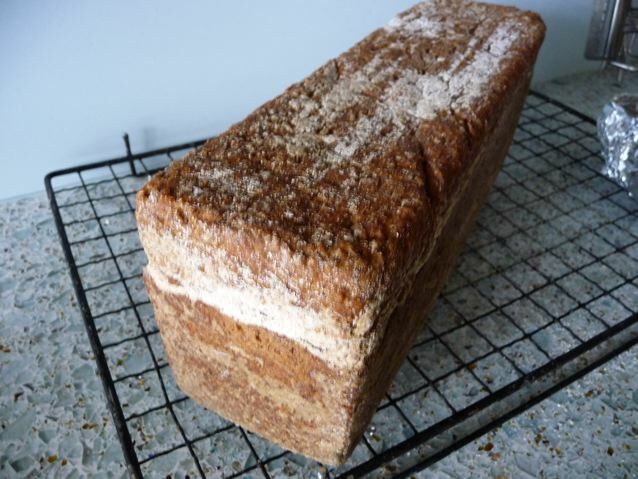 I personally find rye bread easier to digest than wheat bread, but maybe that is because I ate a fair bit of it when I was a child, who knows? I remember our first encounter with spelt flour vividly; Brian bought a bag home one day and said he was going to make Roman Centurion slipper bread, this was in the days when we really hadn’t done any bread baking at all at home and this was the recipe on the side of the bag. I can’t even remember which brand it was now. We mixed the dough and produced some very flat and rather strange bread that we didn’t like very much, deciding that Roman Centurions probably used it in their boots for extra liners, and the bag of flour disappeared onto the back of the shelf. Recently I was asked by a friend if I could make them an all spelt loaf and I had to say that I wasn’t very good at making them, so I asked Andrew at the Loaf in Crich for his formula (having seen a lovely photo on Twitter of his loaves, looking all nicely risen with good open slashes) and he kindly shared the recipe and here it is for all to try. Like so many of the breads and cakes I make I don’t make them over and over again until I get them absolutely right before I write about them here. I am not that sort of blogger. 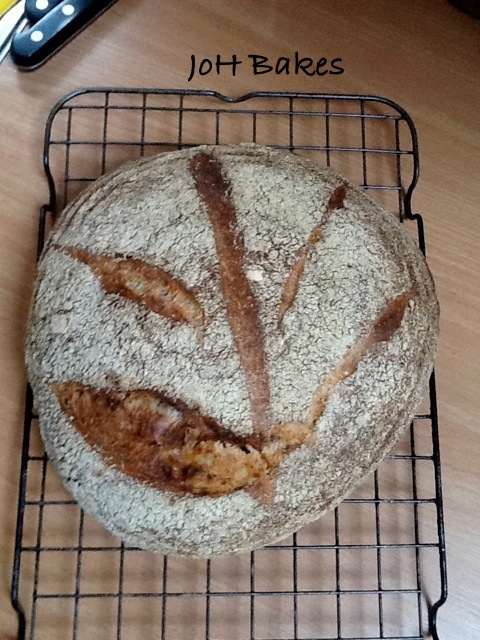 To a certain extent for me, every loaf is a bit of an experiment, I learn (or re-visit the same mistakes!) each time I add water to flour. Even though I have been baking for a handful of years now, the number of loaves I have actually made is probably less than a professional baker would make in a few days. So after all that preamble – here goes! 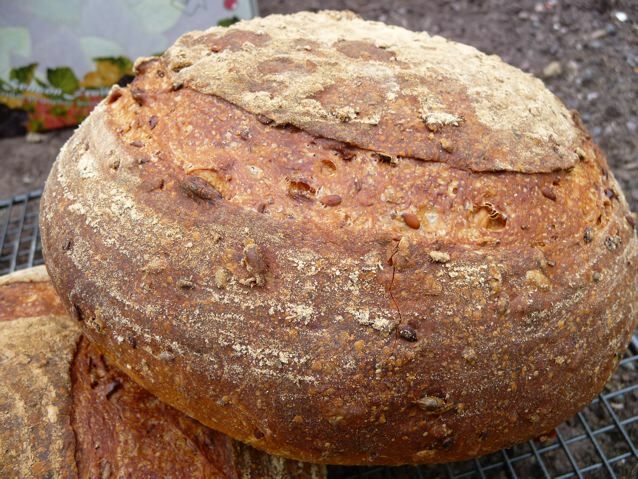 Andrew’s formula uses a rye sourdough starter to start the whole process off, which he calls a ‘rye sloppy’. If you only have a wheat starter then you can convert a small proportion of this to rye over a few days by feeding it with wholegrain rye flour and water instead. I keep both a wheat starter and a rye starter going, I refresh them once a week if I am not using them for baking and keep them in the fridge unless I am planning doing a lot of baking over a period of a few days. 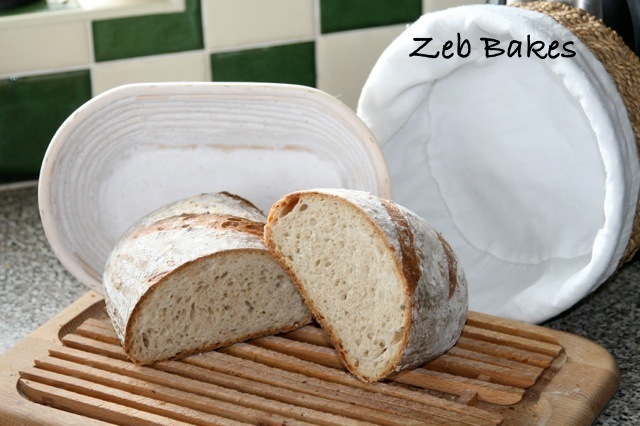 If you are not worried about a small proportion of wheat in your bread then just use your wheat starter. Leave in a covered bowl to ferment. The time this takes will depend on how warm it is. I left mine overnight. Mix all the above together well and leave for three hours to prove, folding the dough twice during that period. Shape the dough as you like, I proved these in bannetons. I made three smallish loaves of around 550 g each, then leave for a shortish final prove. I baked these after 45 mins proving in front of a radiator – a much shorter time than I would usually leave a sourdough loaf on its final prove – and I think that has been my mistake in the past, leaving spelt too long on the final prove, Andrew’s note to me indicated that might be a good way to go. When experimenting with a dough that is unfamiliar, do make notes, I would try and remember if it was hot or cold, if possible have a little temperature gadget in your kitchen. I have one from the Science Museum in London that is very useful. Note the ambient temperature and the times the dough has sat in prove (be honest here, if you forgot it, then write it down regardless!) and if possible take photos to jog your memory. Keep making the same dough and either shorten or lengthen the proof times and you will get a result you like in the end. I baked these smallish loaves at 220 ºC for about 20 minutes and then reduced the temperature to 200 ºC for another 20 minutes and that seemed about right. I tend to bake my bread longer than many people do. I see commercially that bread seems to be baked for shorter periods of time, maybe a commercial oven is different but I prefer a ‘well-baked loaf’ nearly always. My small thoughts : handle this dough gently, don’t knock the air out of it when you fold it, and be kind to the dough when you come to shape it; try and preserve the air that is in the dough from the first fermentation stage. The folding process stretches the bubbles that are forming and traps them in the dough, and they help to give the dough some structure. Don’t spend a long time staring at the dough once you have turned it out prior to baking it. Slash it simply with one long angled cut, slightly off the centre line as if you are slitting an envelope – the more cuts you make on the top, the more the dough will lose surface tension and flatten out. Decide what you are going to do before you turn it out and be quick and decisive and get it into the oven nice and speedily. An old slashing post of mine here might give you some ideas here. Spelt flour is also lovely in biscuits and cakes, so you can always use it that way too. I guess I should be thinking about festive baking… I have been reading lots of lovely blogs full of exciting projects, but I haven’t lifted a festive finger yet, no shopping, no crafting, nothing has happened here. This is not to say there won’t be any but don’t hold your breath! 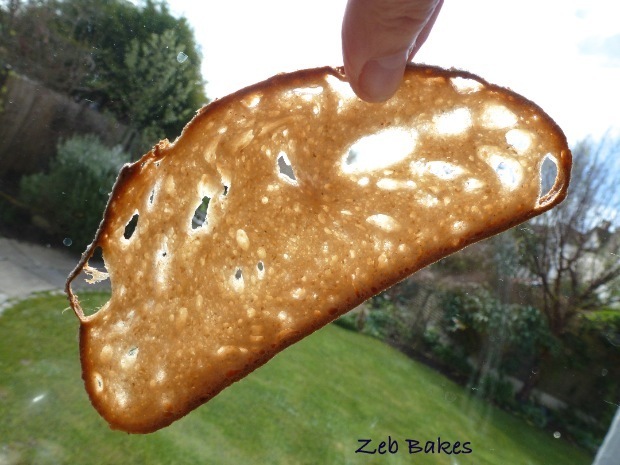 If any other spelt fans want to share their tips and thoughts on baking with spelt I am all ‘ears’ ! 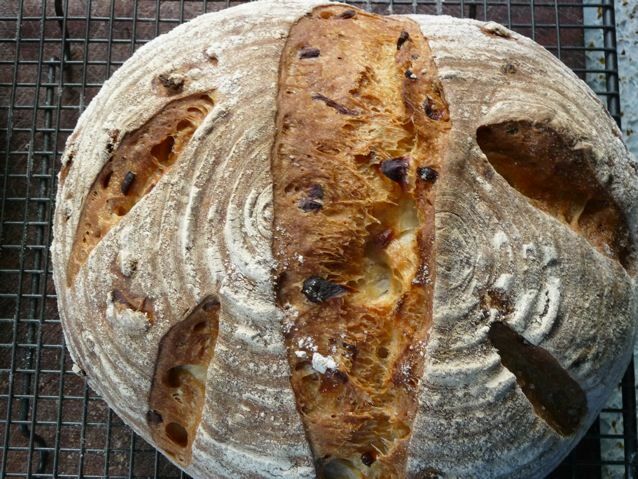 This entry was posted in Bakers, Bread, Recipes and tagged 100% spelt, Andrew Auld, baking, Bread, sourdough, the loaf crich on 14/12/2012 by Joanna. Mix well and knead or not as you prefer. First prove 3 hours with two folds at hourly intervals. Bake in a preheated oven with steam at 220 °C for 25 mins and then reduce heat to 200 °C for a further 20 – 25 mins. Despite the extra bit of yeast, this dough took about three hours to do its first prove. My kitchen was around 18 C most of the day so after an hour or so I put the dough inside my top oven with the door held slightly ajar with a teatowel in the door so the oven light would stay on. The light was enough to bring the internal temperature of the oven up to around 24 C. I needed to rotate the bowl occasionally as one side got warmer than the other but it works very well and isn’t as expensive as putting the heating on just for the dough! 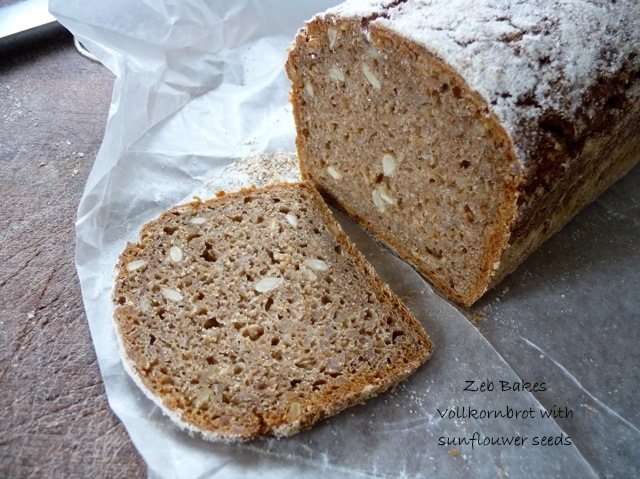 I then split the dough into two and thought I would have a go at making a loaf with a braid on the top. I took three balls of 60 g of dough each and rolled them into long even strands and made a three stranded plait which I put in the bottom of the banneton. 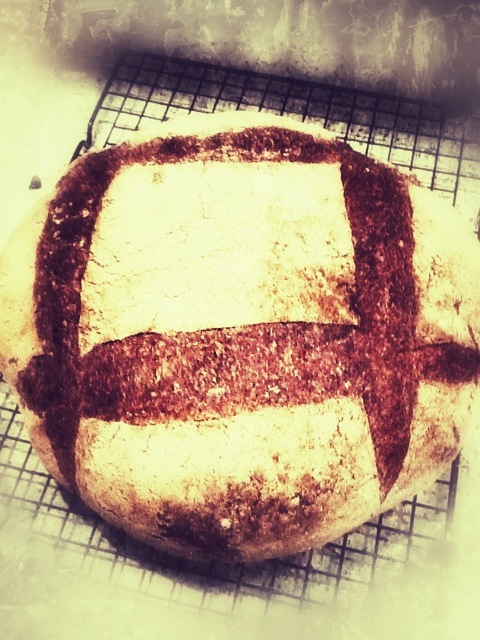 Then I added a boule of dough on top of that, so that when I turned it out the plait would be on the top. If I do this again I will make longer strands and a fatter plait, maybe 90 g per strand. The dough that forms the main part of the loaf weighed 850 g. I made the remaining dough into a smaller loaf. Why the braid? I have been watching Britain’s Best Bakery on ITV1 for the last couple of weeks, cheering on all the wonderful bakers, patissiers and cake makers who have been brave enough to let a TV crew into their workplaces and film them. Watching the shows I was struck by how passionate the bakers are, how much they care about their craft. The show has a competitive element, but in some ways that is the least important part of the show for me. I just like to watch the teamwork involved, the dough being shaped, admire the different ovens, the mixers, the hustle and bustle, and the icing on the cakes. The judges have a delightful manner and accentuate the positives they find in each and every one of the bakers they talk to; the challenges they set the bakeries are quite fun, but a bit random and not necessarily equal in skill difficulty. The section where they visit the bakeries and have a look round and a quick chat and a few words from enthusiastic customers is for me the best part of the show. They showcase the bakeries and their warm, inviting interiors and beautiful displays of cakes and breads, their cafés and delighted customers really well. I found myself making mental notes about where they all were and hoping that one day I would get to pop in and sample their baked goodies for myself. I really enjoyed seeing my friends at the Loaf in Crich who were on this week, the judges were very complimentary about their big green olive sourdough and it was lovely to see the shop and café humming with life and happy customers. I have almost got the 100% spelt sourdough (my personal nightmare) right now, thanks to expert advice from Andrew at the loaf. Here it is looking decidedly more airy than my usual bricks. 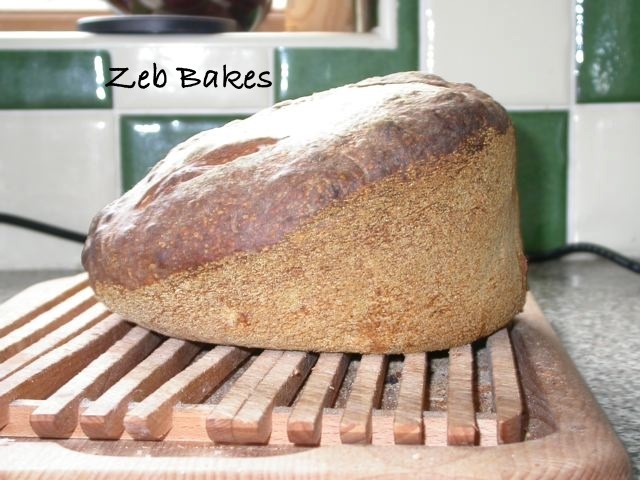 One of the most rewarding things about dabbling in breadmaking has been all the wonderful people I have come across while doing it. Andrew is one of those people who has always been kind hearted and encouraging. We all need encouragement. It is well worth having a look at, recording or using Catch up TV options to whizz through the adverts and share in the delight and see places that you might want to visit if you were in that part of the UK. The series is in the second of four weeks, so plenty of time to catch some of the shows as they travel around the UK. In Bristol we have the brand new East Bristol Bakery in St Mark’s Road, Easton and Laura Hart is opening her new bakery this Saturday 8th December, both highly recommended! I get so excited when I walk past a bakery and I always have to go in and buy something, even if I have a breadbin full at home I can’t resist. 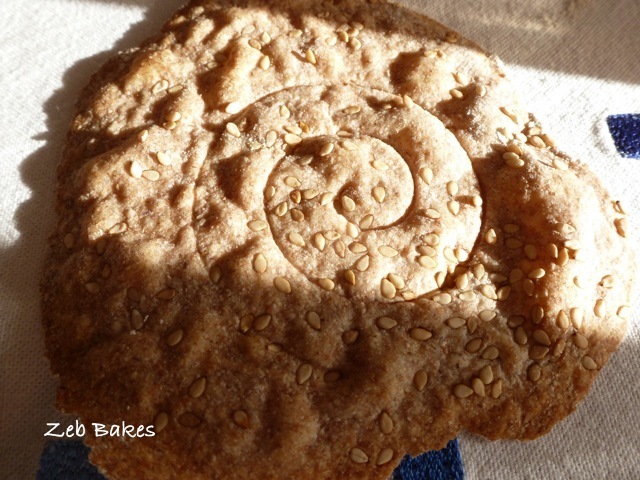 This entry was posted in Bakers, Bread, Bristol and tagged baking, braids, Britain's Best Bakery, East Bristol Bakery, Fun, Hart's Bakery, Metfield Bakery, real bread, sourdough baking, the loaf crich on 06/12/2012 by Joanna. I love the way her tail just doesn’t quite fit in there! Pic shown by permission of Sunny’s Mum.